Posted on July 9, 2011 January 28, 2016 by I'm Ash Walsh. It’s such a ridiculous, and redundant picture, isn’t it? Nothing but a bunch of stubborn fools running for miles and miles, and for no real reason at all. …Or is it something more? I see something crazy and beautiful..
A tangled web of discipline, friendship, character, purpose, meaning.. fate. 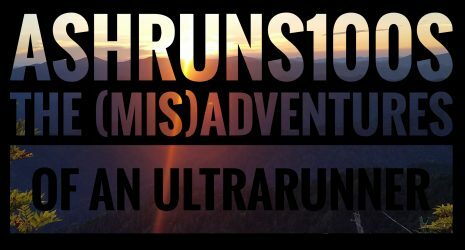 I am laying here, 1:26 in the morning, 2 weeks after my most recent attempt at running 100 miles, and I’m wide awake thinking about just that: ULTRARUNNING. NO..running 100 miles, to be more specific. I’m talking the entire thing-the good, the bad, the ugly. How awful it feels. How incredible it feels. How much I crave it. How it hurts so bad, yet feels so dang good. How it rips me to shreds, yet builds me up. Something about that particular distance just etches something deep into my soul. And something about NOT completing it, but ending up in the ICU, made me feel whole…. Fort Clinch 100 mile, the creation of Caleb Wilson, sounded like a FUN race. It caught my attention instantly: A 10 mile loop right next to and partly on the beach, dense single track trails, a piece of history, and gently rolling terrain. It was set to take place on June 24, in Florida. I think all that my mind registered when checking out the info was “beach and trails”. Apparently I forgot the fact that it was smack dab in the middle of summer..in FLORIDA.. or I may have ducked out of this one. 100 is no cakewalk. Running in Florida is no cakewalk. We’re talking heat, humidity, and hurt times a hundred, for a hundred….who does that???? Well, at least 40 crazy people do that. We toed the line for either the 50 mile, 24 hour, or 100 mile race. A few elite and veteran ultrarunners, and even a couple first timers were there to sweat it out. Before I knew it, 6:24 arrived & Caleb corralled everyone for the start. Odd time was to allow the runners to see the sunrise on the coast as they started their race, cool right? Caleb introduced some family and friends that helped make his event possible. To me, there’s nothing like a good family feel to make a race special. I love that. After a quick, “Go!” everyone took off and fell into place. I was running slowly, but found myself in the lead pack. I was comfortable with this and started chatting with a few women. Michelle Matys, whom I’d met the night before while camping, was running the 50 & was going for sub 8. A mutual friend of ours, Jen Vogel, was coming to pace her for her last 20. I knew she needed 9-10 minute miles, so I figured I would stick with her for a bit. Another woman, Kellie Smirnoff, was also running the 50, and was bursting with energy. 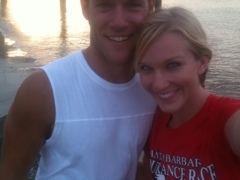 She provided the positive vibe I love so much in a running partner. The three of us ran together for a bit. But I checked my Garmin about 3 miles in and realized I was running 8:30’s. Not cool for a 100! I backed off from them and decided I had to be smart early on. Good thing I did, because I quickly realized that the course was tough. Really tough! These trails were really just humidity filled tunnels in disguise, and on ancient sand dunes. – was the general feeling of the first loop. Regardless of the humidity, I stuck with a 10min pace for the next 7 miles and brought my first loop in right around 1:40. Ouch! I can carry an 8 minute pace in my training ultra runs, but could barely breathe doing 10 minute miles here! When I got back to the start/finish, I yelled at my husband Dan to lace up for a loop or two. I needed some company (aka distraction) soon! The next loop went pretty well, same 10 min pace, plus aid station stops. Caleb’s mom, Chaundra, and his sisters were manning the halfway point aid station and were quite entertaining and helpful. I found myself forgetting I was racing and more just hanging out with them– they were THAT FUN! I was running strong early, female lead for the first loop or two, but I couldn’t hold it, it was just too hot. I was racking up time at aid stations trying to stay hydrated anyway, and knew I would have to give up my lead just to stay strong, period. Amy Costa, a super fast legend of a runner, was right there to pick up her rightful place in first, and soon enough was far out of site. I got to run with her for a bit though, and was totally intrigued by her. I knew she would run a great race that day, and I only hoped to come in a close second. I picked up Dan for my 3rd loop and he paced me for a fast one. I kept telling him how I was meeting lots of new friends and really enjoying myself. I was loving all of the friendly runners, and really just enjoying every part of the day. The hours went by, and the sun kept scorching. Hotter and hotter by the minute. Runners started dropping like flies. The conditions felt unrunnable to many. Elite runners, veterans, newbies.. It didn’t matter. The heat wasn’t discriminating! (80% dropped come to find out later!) Even Michelle, my new friend, had been taken to the ER after passing out, right before closing in on her potential 50 mile win. Awful news! Though it was tougher and hotter than any race I had ever experienced.. I remained strongly optimistic of a good finish. I felt great. I slowed a bit during the hottest hours of the day, but stayed focused on my goal. Dusk finally came to bring a little relief from the heat. But with it came a severe lightening storm. I had finished up 60 miles in about 13 hours, but I had to stop when Caleb had to call a timeout for lightening. We were on the beach, after all. We sat for almost an hour, getting tighter by the minute. Several more decided to drop. Around the end of that hour, Caleb got a call that Amy was dropping- she was at 65 miles, out braving the storm, but had gotten a little delirious, and needed an IV. CRAP! Another strong athlete out? I was nervous now, but I remembered something Jen said to me in passing earlier in the day, “You just gotta be the cockroach.” In other words- outlast adversity. I could do that, I had no problem pushing through at this point. I felt great. 40 more miles and the race was done. Maybe even a negative split? I was ready! Little did I know.. It was getting late, and I needed to get moving again, so when the storm chilled out a little, I asked Dan to come back out with me for my 7th loop in the dark. We grabbed our lamps and fuel and started out with a nice comfortable pace, laughing hard and enjoying our run together. Dan had already finished 2 loops with me, but still had energy to push me through a 3rd. It felt good outside, now that it was dark, and the rain had cooled the temps down a bit. So we were finally loving the trail time! I noticed my mind slipping at about 67 miles, when I ran into a web and started spazzing out. I thought one of those gigantic spiders landed on my head. Daniel assured me I was okay, but I remember feeling abnormally paranoid and petrified. Right after that little freak out, I started getting tunnel vision, and told Daniel he needed to slow down, because I was having trouble seeing his feet. “Ash, we’re already going slow. You okay?” he asked. I promised him I was fine, but I guess he knew better, because he told me we would take a quick break once we reached the road crossing. I was fine with that, I felt weird. We walked onto the road, and I could feel my mind slipping quickly. I told Daniel I thought I might pass out. We sat down on a bench beside the road, and I blacked out. Daniel splashed me with his cold water and I startled back to consciousness. I was extremely upset and confused when I did. What happened to me? I was fine 5 minutes ago! He gave me a gel and water and tried to get me moving again. I got back up after my gel, and basically declared war on the course. I wanted to finish, I knew I could finish. I just needed to bounce back. Daniel had seen me like this before. In my first hundred, I basically came back from the dead and finished despite tough conditions, and same with my second. He’d witnessed me conquer adversity time and time again. He wasn’t too worried, even when I started staggering all over the trail, and slurring my speech. At about 67.5 mile while on the road portion of the course, Sue Anger approached in her car and asked if I was okay. She could tell I was struggling. Daniel, still believing in my ability to pull through, assured her that I could handle it. She believed him, but phoned Caleb to keep an eye out regardless. What a kind soul:). Shortly after Sue left, Caleb drove up bearing gifts of chia and soup! 🙂 I was getting progressively worse, but Dan was still optimistic of my fighting spirit, and told Caleb we would be back to the aid soon to finish out my 70 miles, we would just be slow. Caleb agreed drove back to his aid station. All though he had brought me fuel, apparently I didn’t even eat it, but just held it in my hand. I was zoned out and walking on the pavement, which was no longer a part of the course at that point. Daniel tried to guide me back into the woods, but I refused to move. Instead I mumbled something about dying, and dropped to the road..and blacked out again, spilling my chia all over me. Daniel was finally worried! He tried everything to wake me up- everything from screaming things about snakes next to me, to slapping me clear across the face. Nothing. I was out cold. He waited for a moment for some runners or cars to come by.. No one. He looked for my trusty running buddy, my iPhone, but I had left it back at the start/finish due to the storm! Go figure! He couldn’t leave me on the side of the road.. passed out..& not to mentioned the course was full of gators, snakes, bobcats, and spiders. He realized he had no choice but to pick me up and run the final 2.5 miles with me on his back, back to the start to get help. Daniel is a very fit guy, but he had almost 30 miles on his legs, and for someone who doesn’t run long distance, he was already in a world of hurt. But he threw me over his shoulders, dead weight and all, and took off on a determined run. I was slipping in and out of consciousness while on his back, alternating between hallucinating, screaming, and being out like a lightbulb. Daniel didn’t see a soul for the next couple of miles, surprisingly, so he just kept running towards the station- ignoring all pain in his legs and body to get me to safety….:)…. (how romantic;)) Somehow, even though I apparently had been screaming my lungs out, no one heard me. What Im sure felt like a lifetime to him, Dan finally made it back with me in tow. He got the attention of Caleb and some others as he approached the station. They realized what was going on, and quickly helped. My superhero husband propped me into a chair, and collapsed in fatigue. After some evaluation by everyone (and apparently a remark by Jen that I was “demon possessed” 🙂 ) an ambulance was called. I don’t remember riding in the ambulance or going into the hospital. The only thing I remember is hearing a nurse explain to Dan that they were sorry, but I was really bad off and that I would be admitted to intensive care, and that he should be prepared for me to be there for several days. And then I freaked out and blacked out again, and didn’t come to for roughly 11 more hours. But when I did wake, I woke up to voices. 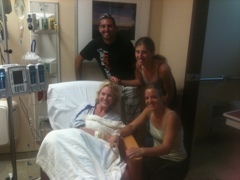 Dan, Jen, and Caleb were gathered near my hospital bed replaying the previous night. “Whoa! What happened? !”, I wondered. They began to relay to me everything that had gone down the night before.. Crazy stories about things I was shouting, and doing during my hallucinations, how scared they all were for my life, and so on. Caleb even mentioned that during my screaming fits, I was insisting that I wouldn’t quit…( Haha doesn’t shock me.) I couldn’t believe the things I was hearing, though. Did this really just happen? Did I go from running strong, to almost dying… over a tiny window of time? Apparently I did. But, how? If you guessed rhabdomyolosis, you guessed right. race..such a novice mistake for me. I never skimp on protein during races- LESSON LEARNED!!!!!!! I was happy to hear that a new friend, Bruce, finished his first 100, in brutal conditions, in first. Only two others finished- one being the incredible Juli Airstars, who has shown me so much love and understanding over the past. few weeks. So how did I feel so whole and complete after such an epic fail? One word, and it’s no surprise: PEOPLE. In all of my life, I have never felt so loved than I have over these past few weeks. So many from the fort clinch race checked on me regularly- Juli, Jen Vogel, Bruce, Michelle Matys, Kellie Smirnoff , and of course Caleb, to name a few, sent emails, texts, or called often. I have had friends bring me dinners, family watch my kids, and training partners (like Beth McCurdy, and Beth Presten) constantly feeding me words of encouragement! I was shocked at all of that support, partly because those who know me know that I am quite the loner, to say the least. I was surprised that, despite my constant attempts to keep people at arms length, they all still poured on the love.. simply because they knew I needed it. And since I have had nothing to do but lay in bed, I’ve had a lot of time to think about these things. I had no idea that Fort Clinch would go down the way it did. I was planning an day at the beach, basically, and not a death wish. But everything happens for a reason..& I firmly believe that. Because of the unexpected sequence of events, I bonded with several people and made some new, and very meaningful friendships.. Some that I never ever expected, and that I feel will last a lifetime. I learned that I don’t have to keep my friends at a “safe distance”. I’ve been blessed with a great group of people around me, and they deserve all the love I can give. I found out that my discipline and grit can actually kill me if I’m not careful. And honestly, I like that. (I’m not gonna lie!) It fascinates me that the lead women out there all pushed until we passed out…all of us being moms..& Juli being one of the only 3 to finish-that’s saying something about female runners, and our iron wills ;). I know people probably think that’s weird, but oh well. It’s a true statement. 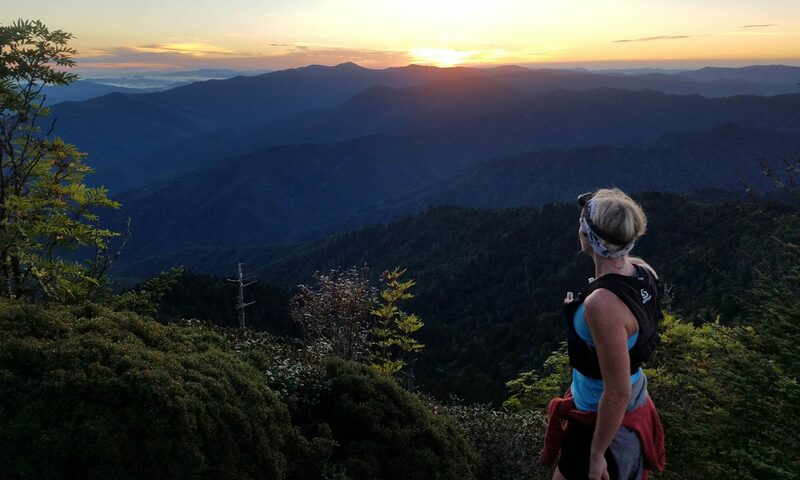 These types of experiences and realizations only occur in my life because of ultrarunning. How awesome is that? To learn profound things, from doing something as simple as putting one foot in front of the other. I don’t think it’s a silly sport. I think it’s an amazing , and very deep sport. Running 100 miles creates growth in every way imaginable, discipline applicable to every area of life, priceless friendships, and meaning and depth beyond words. I love 100 miles. I love attempting it. I love everything in my life that is born and brought to light because of it. Fort Clinch was an incredible adventure. I’m truly grateful I was a part of it, and that everything happened just the way it did. Can’t wait for more!